SOLER Y LLACH: Soler y Llach - Stamps and Covers of the World Auktion ist bereits beendet! NEPAL. Mi.22, 23 (3). 1923 (August). SALYAN to KATHMANDU. 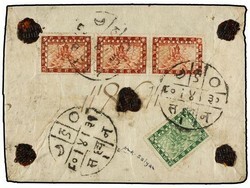 Registered double-weight cover franked with 4 pice green and strip of three 8 pice red.